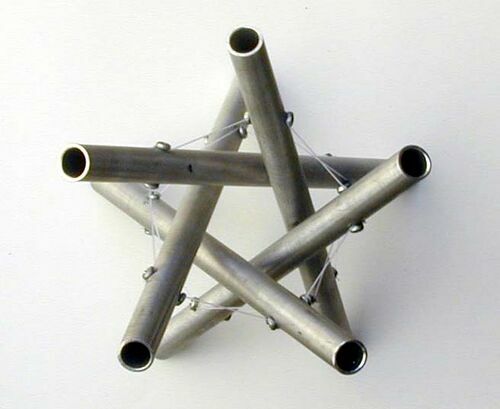 Read here about tensegrity structures or principles that have musical applications. All structures vibrate, hence have some musical properties. Shirko Faroughi sought to define the vibration properties of tensegrity structures . He sought an algorithm consisting of the eigenvalue sensitivity and modal updating along with the mode tracking to analyze vibrational properties. The optimum values of the design parameters including the pre-tension or pre-stress force, element section area, etc. These values must meet design constraints involving the buckling constraint for rod elements and the strength constraints for all components of the system. The tension network of a tensegrity always has a little "give", and its tendons can be plucked. When energized in this way, they vibrate until the energy is dispersed throughout the structure as heat. If these vibrations are between 20 and 20,000 cycles per second (Hertz) at normal atmospheric pressure they will be audible to the human ear as "sound", and since they persist in the same frequency range until dying out, they are perceived as sounding a steady note. The steel cables of Snelson's Needle Tower can be plucked in this way, and a low-pitched hum can be heard to emanate from the structure until the vibration dies out. Snelson and others often speak of "tuning" the tensegrity. The term is found fitting for a few reasons. Interdependence and harmony: The high interdependence of the tension adjustments in a typical tensegrity are unusual to those structural engineers accustomed to traditional structures. Wood, for example is sanded or planed, not tuned. The word "tune" evokes the musical principle of inter-cooperation with other entities separated in space; the violin tunes with the flutes in order to make music together, and the tension in any given tension member is highly interdependent with the tension in every other member. An isolated vibrating string does not propagate sound into air very well. The tensed string in a string instrument is heard due to an interaction between the string and the sound board. The string is affixed to the sound board by means of the tuning peg. Traditional tensegrities lack a sound board: the tension member connects directly to a compression member that is usually optimized for its minimal size and inner rigidity. These characteristics contrast sharply with a sound board, that should have a large surface area in contact with the air, and be made of a relatively porous substance. In addition to the physical properties above, some tensegrity researchers reference musical ideas or concepts. Mozart I by Snelson. Photo by Tensegrity Wiki." link="Snelson, Kenneth"
Many musicians and fashion designers are inspired by tensegrity to create works of musical art or performance that specifically reference tensegrity. For examples, see Moods. The film Tensegrity by Lindahl is an example of tensegrity inspiring music, fashion and mood." link="Moods"
A list of musical instruments with features that relate to tensegrity. 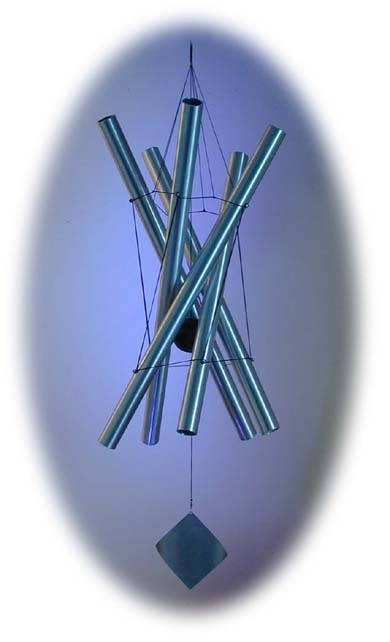 Tchimes founded by Greg Cherry, Ron Barnett and others marketed and sold a set of tensegrity prisms where the compression struts are aluminum tubes tuned to a musical scale. Tchimes' 5 strut prism-based chime, for example, was constructed with aluminum alloy tubes 1/2 inch diameter, 9 inches long. The overall height of the chime from hanging ring to the bottom of the sail was 18 inches. The 5 tubes were tuned in a pentatonic scale with the notes E G# A# B C# in the 6th octave. The tension component was high strength mono filament with UV inhibitors. A striker ball was suspended inside the prism. The ball could slide up and down the string to adjust the sound from silent to full volume. 5 strut tchime, side view." 5 strut chime prism by tchime"
Todd Hoff posted to Vimeo a three strut chime, with struts tuned to the notes A, C and D above middle C. If A is 440 cycles per second, then the frequencies at which the struts vibrate are 440, 523, and 587 cycles per second, respectively. The video is filmed sideways. The instrument was mounted on a 3 strut tensegrity frame, but the sound had nothing to do with the frame or the tension of the ropes. The sounds heard are synthesized, not based on the vibration frequency of the rope like a normal stringed instrument. It is binary: the rope acts as a switch. When the rope is pulled more than a certain amount, the computer plays a sound specific to the rope which was pulled. Pulling harder did not change the sound. 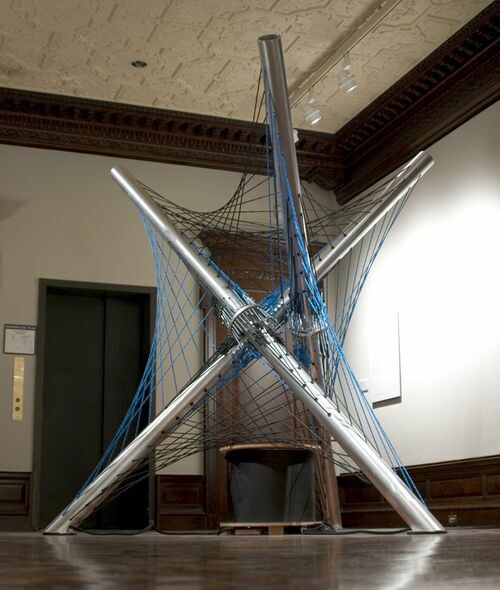 "Rope and Sound" by Squid Labs, 2005" http://www.squid-labs.com/projects/tensegrity/index.html"
In 2013, the device was put up for sale. Vibration properties in the design of tensegrity structure, by Faroughi, Journal of Vibration and Control July 17, 2013 1077546313493310  Forces Made Visible by Eleanor Heartney, p.25 and p.28, Kenneth Snelson Art and Ideas, eBook PDF.